What's New? - Explore the Library! Congratulations to the William Allen White Award Winner for 2015-2016! 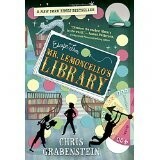 Check out this fun read from the LMS Library! The William Allen White Children's Book Award is a set of two annual awards for books selected by vote of Kansas schoolchildren from lists prepared by committee. As a single award it was established in 1952 by Ruth Garver Gagliardo, a children's literature specialist at Emporia State University, which continues to direct the program. It is named for William Allen White (1868–1944), long-time publisher and editor of The Emporia Gazette. The White Award is the oldest statewide children's choice book award in the United States. The books that have been nominated for consideration for this year's award are now available in the LMS Library! Read at least 2 of them and you may vote on next year's award winner.